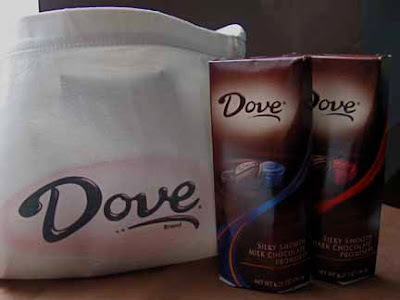 the dove chocolate center of excellence is having a great unveiling and i have 20 limited edition bags of dove chocolate to give away to the first 20 entries. please email chocolate-snob by october 6th. each prize is a limited edition and worth $40. the contest ends on october 6th. eligibility can be 21+ and residents of the 50 us and dc. the winner’s names will be posted on chocolate-snob and can also be received through correspondence with chocolate-snob. your chocolate should only list a few ingredients on the back (cacao beans, sugar, cocoa butter, pure cane sugar, and vanilla) and it definitely should not include melamine. read your labels very carefully and buy your chocolate from artisans and countries that have a history of producing quality products. the british chocolate maker cadbury today said it was recalling 11 product ranges from sale in china as the country's tainted milk scandal continued to grow. the withdrawals come over fears that the products could contain the chemical melamine, which can cause kidney stones and lead to kidney failure. contaminated milk products have killed four chinese babies and made tens of thousands of others ill. melamine can be added to milk to hide the fact that it has been watered down. in a statement, cadbury said tests carried out on the chocolates had "cast doubt on the integrity of a range of our products manufactured in china". it is not yet clear whether the tests revealed melamine, and the company said products on sale in the uk were not affected. the recalled products – which include eclairs and dairy milk – were manufactured in the chinese capital beijing and sold in mainland china, hong kong and taiwan. one product was also exported to australia. "we believe it is appropriate to take a precautionary step to withdraw from the market all of our cadbury chocolate products that have been manufactured in beijing, pending further supply of fresh products," the cadbury statement said. hong kong's centre for food safety appealed to people to "stop consuming the chocolate products concerned", adding: "we would alert the trade to stop selling the affected products." two us manufacturers are already investigating indonesian claims that high traces of melamine were found in oreo wafers, m&ms and snickers imported from china. the indonesian food and drug monitoring agency said a dozen allegedly tainted products distributed nationwide, including those brands, had repeatedly tested positive last week. kraft foods and mars said they were adhering to a recall order, but stressed that the same products had been cleared of melamine in other asian countries. the eu has banned all imported baby food from china. we have our winners to the los angeles chocolate salon! Ghirardelli Chocolate has a history that dates back to California’s gold rush. At 31 years old, he was the owner of a fairly successful confectionery business in Lima, Peru. However, Domingo had heard of the fabulous riches in gold being found in California, and in 1849 he sailed to California with the intention of striking it rich (and then going back to Peru). Domingo was out there in the hills and streams doing his best to find his riches, but like a few of the smarter miners he soon found it was much more profitable to sell supplies to other miners. Domingo first opened a store in the boomtown of Hornitos. He was forced to buy supplies for his store in Stockton, at the time the only general merchandise store that was around for miles. Domingo believed that he could open a competing store in Stockton, and make a lot more money, if only he could figure out a way to supply it. Domingo bought himself a sloop that he used to sail up and down the San Joaquin River, acquiring supplies in San Francisco and then returning with his merchandise to Stockton. Domingo’s first store front was just a tent, but by the end of 1849 he owned a fleet of river sloops, and buildings in both Stockton and San Francisco. He also had some profitable side lines, including grubstaking prospectors in exchange for a share in any gold they might find; he owned a hotel; and he even owned one of California's first soda fountains (more than a decade before the marble fountain was invented). Unfortunately, by 1851 Domingo was starting over again. On May 3, 1851, a fire swept through San Francisco and destroyed 1500 buildings. Three days later a fire swept through Stockton and destroyed half of that city. In less than a week Domingo lost everything. Domingo first tried opening the Cairo Coffee House in San Francisco, but it was a money loser, and he decided to go back into his old trade as a confectioner. He formed a partnership with a man named Girard, and they opened a confectionery store on Kearny and Washington in San Francisco. Domingo then sent for his wife, who was still living in Lima, Peru. Shortly after she arrived Domingo bought out his partner, and renamed his store "Mrs. Ghirardelli & Company." The rest is, of course, history. which chocolate producer sold supplies to the miners during gold rush? the contest will end at midnight tonight. all correct entries will be entered into a pool. not a winner? not to worry, you may get tickets for $20.00 at the door or $17.50 in advance - consider yourself very lucky! please join me at the los angeles chocolate salon! the salon is fabulous in capturing unique and divine artisans. some of those who have participated in the past, are now big names in the chocolate world. i cannot wait to find this season's up and coming chocolatiers. Chocolate lovers, en garde! The premier major chocolate show in the Los Angeles area this millenium takes place at the 2nd Annual Los Angeles Luxury CHOCOLATE SALON on Sunday, October 5th, 2008 at the Pasadena Center. Chocolate aficionados, fanatics, lovers and addicts can taste & experience the finest in artisan, gourmet & premium chocolate in one of the world's great culinary metropolitan areas. Featured 2008 Los Angeles Luxury CHOCOLATE SALON chocolatiers and confectioners include Mignon Chocolate, Chocolate All the Time, Sacred Chocolate, Arlene's Gourmet Toffee, Valerie Confections, Jade Chocolates, Malibu Toffee, Guittard Chocolate Company, Marti Chocolatt, The Chocolate Traveler, Poco Dolce, Amano Artisan Chocolate, San Francisco Toffee Company, Choclatique, Chuao Chocolatier, the TeaRoom chocolates, Cosmic Chocolate, Original Hawaiian Chocolate Factory, Plush Puffs Gourmet Marshmallows, Rushburn Toffee Company, Downey's Chocolates, The Chocolate Basket, Christopher Michael Artisan Chocolates, DOVE Chocolate Discoveries, Calcareous Vineyards, Vermeer Dutch Chocolate Cream Liqueur, Nespresso gourmet coffee, and more. los angeles chocolate salon sunday, october 5th!